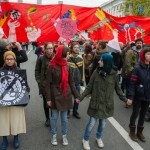 Reporter Ekaterina Danilova attended today’s May Day parade in St. Petersburg, Russia where various sectors of civil society came out to mark International Workers’ Day. 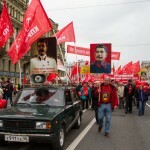 The parade brought out a cross-section of political forces; from conservative nationalists to anarchists and members of the LGBT community. 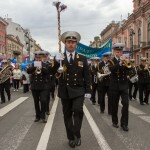 All photos by Ekaterina Danilova. Click on any image to launch the slideshow. 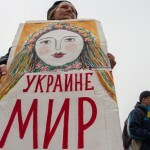 37,000 people took part in the May 1st demonstration in St. Petersburg according to official estimates. 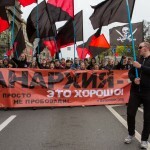 Many different groups took part in the parade, from supporters of President Vladimir Putin to anarchists. 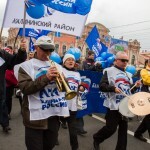 Pro-government and ruling party “United Russia” supporters marched with bands and Russian flags. 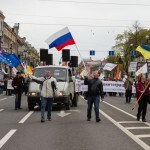 Pro-government demonstrators celebrated the annexation of Crimea and showed their support for Putin. 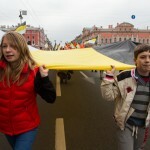 Children carried the flag of nationalists. 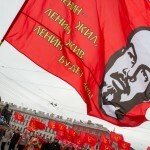 The Communist Party praises the memory of Stalin and calls for a return to the days of the Soviet Union. 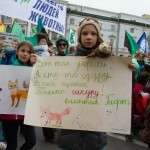 A small group of feminists joined the democratic part of the march. 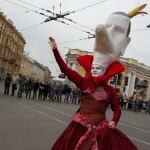 An LGBT activist dressed in a drag costume of the tsars with a hat in the shape of Putin’s face with Crimea written on the back. A woman tried to take the sign away from an LGBT activist at the end of the march. 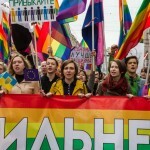 LGBT activists kiss at a rally in support of Ukraine after the march.